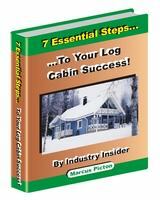 Log Cabin Ceilings – What works well? Most log cabin ceilings are timber, but in some situations plasterboard could actually make a lot of sense! Why is this? Well in some countries fire regulations means using timber alone on a ceiling between downstairs and upstairs will not meet fire regulations, even if fire treatment is applied! 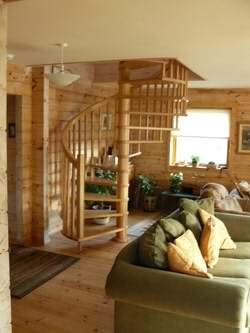 If your log cabin is single storey then this will not apply, but sometimes plasterboard can be used for other reasons too. Timber is obviously a great fit for most log cabin ceilings. While rebated tongue and groove boarding is normally used, the width, thickness, profile and the timber itself can vary. Some boards have quite a subtle profile giving a flatter and more uniform look. Other boards with a big rebate and a more pronounced profile, which catches the eye more and can look more rustic. Depending on the roof structure the boarding can run up and down the roof, or parallel to the eaves. For an unusual visual effect you could even install the boards at 45 degrees! If you are trying to match the logs, try to make sure the timber used for the ceiling boards is the same species and of a similar grade. Different grades will affect the appearance of the wood and especially the amount of knots in a board, will impact on the looks and quality of that board. Depending on the roof design your ceiling boards may be structural or could just be decorative. If it is structural then it will be much thicker and this could allow for a much more pronounced profiles, than a normal board (which will be must thinner). Be careful to avoid boarding which is too thin and may break and warp quite easily. So in which situations would you use plasterboard for log cabin ceilings? Well we have already touched on one important aspect which is fire resistance. Plasterboard has a much higher resistance to fire than timber and this can be very important for ceilings in a 2 storey house in places like the UK, (where timber boarding will not comply to the building regs). 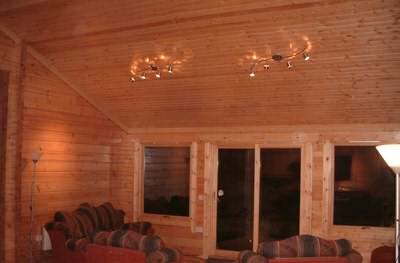 In more than one log cabin we built in the UK we actually had to install plasterboard under timber boarding, so that the owner could meet fire regs and have a timber ceiling!! This seems a crazy situation but unfortunately some countries do go overboard with fire regulations! So when else would you use plasterboard? Well if you have low ceilings and want to give an impression of more height a lightly coloured plasterboard ceiling will certainly do this better than timber. Plasterboard is also a look cheaper than timber, so if there are some areas of your log cabin you don’t care about so much, then this could save money. Also in dark areas, where natural light is limited, again plasterboard will make it feel lighter and more airy.